In 1958, Knute Skinner, a Ph.D. candidate at Iowa University, made an impulsive decision to leave for the Canary Islands and spend the rest of his life there writing poetry. His travels took him to Ireland, Denmark, England, Spain, Italy, and France. Along the way, his adventures involved diverting men and romantic women, and all the time he was experimenting with his art. Help Me to a Getaway, a memoir of his two-year sojourn, describes a Europe that no longer exists and tells a story which was not at all what the author expected. Born in St. Louis, Missouri, Knute Skinner has had a home in Ireland since 1964. He has taught at the University of Iowa and at Western Washington University, where he was a Professor of English. Retired from teaching, he lives in Killaspuglonane, County Clare with his spouse, Edna Faye Kiel. His most recent book of poetry, Fifty Years: Poems 1957-2007 (Salmon, 2007), collects fifty years of published work, beginning with poems which first saw serial publication in 1957 and continuing through thirteen books. 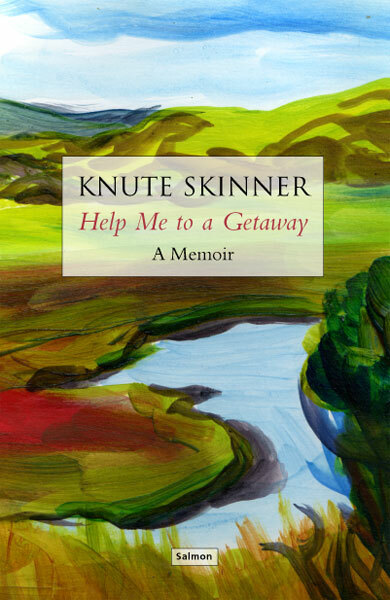 Young writer Knute Skinner leaves the USA in 1958, diverted en route to his Canary Islands destination by a delightful stay in County Clare, followed by further European diversions. The people Skinner stays with or meets around Liscannor are so easy-going and charming that it all seems too good to be true - what nastiness has been excised, you cynically ask? But Skinner, a keen-eyed poet, isn't one for rosy-tinted blarney and you instinctively feel that the bonhomie he relays is genuine. The book restores one's faith in late Fifties Ireland, somewhat besmirched by misery lit. You feel too that if the genial author picked his way carefully as a newcomer today, fifty years on, he would, with his fine manners, attract similar instances of hospitality, even amidst the post-Tiger detritus. As it happens, Skinner would spend much of the rest of his life in Clare, from 1964 onwards. This beautiful, warm-hearted book details betrothals and marriages and children, visits to Copenhagen, Spain and Paris and indeed to his eventual Canary Islands.